Homemade French Crullers are a cinch to prepare. 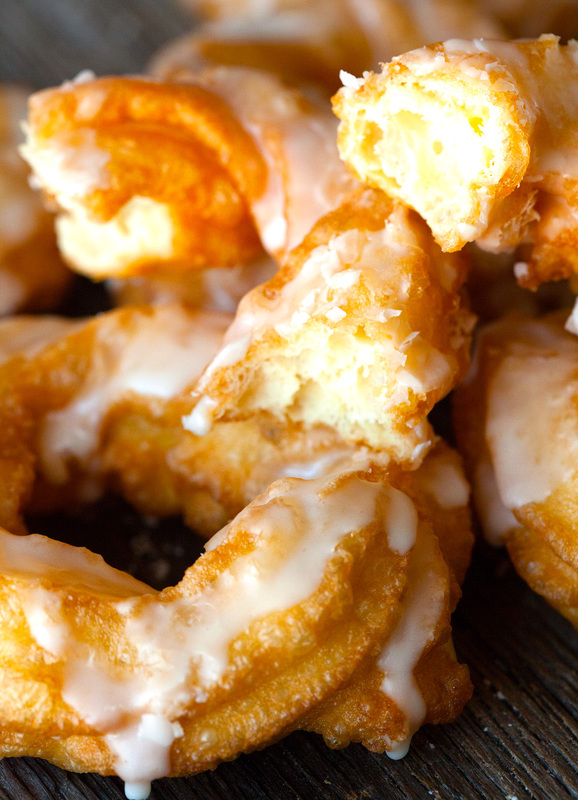 These are one of the lightest and airiest crullers you will ever taste. And drenched in a sweet glaze, of course! Doughnuts. One of my favorite things to make and eat. 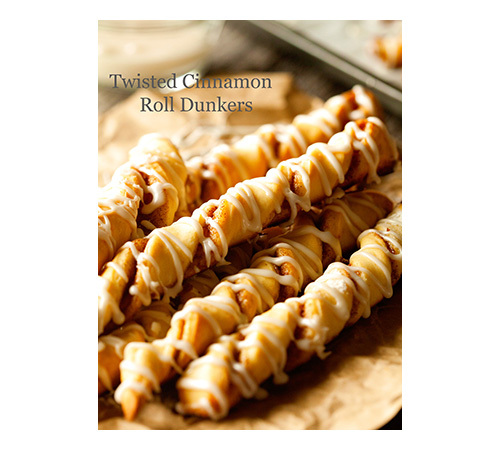 No matter what shape or size, whether they are fried or baked, dusted with powdered sugar, dunked in a glaze or rolled in cinnamon sugar, I love them all. There is no way I could possibly name my favorite of all time – it’s pretty much always my latest version. They are just too good. Needless to say, my latest obsession are these crullers. Before I started to research how to make these, I thought that making crullers involved a lot of work and maybe even a yeast dough. I was so excited when I found out that making crullers is very similar to the process of making churros. And since I have had some experience in that department, I couldn’t wait to get to work on these. You start by preparing a choux pastry or pate a choux. Sounds kind of fancy, but it really couldn’t be simpler. It’s a very light dough that usually consists of butter, sugar, salt, water, and flour. The first four ingredients are brought to a rapid boil in a saucepan followed by the addition of flour. Boiling and thoroughly heating the mixture creates steam, which is released during the cooking process. It’s what causes these crullers to be so light and airy and serves as the raising agent at the same time, which is why we don’t need to add any yeast. Yay! Once the choux pastry has been made, we mix in a couple of eggs and egg whites and that’s it, you guys. Fill a piping bag, and pipe the dough onto small squares of parchment paper. The dough is slightly sticky and somewhat hard to transfer to the oil. So you want to make sure the dough is piped onto individual parchment paper squares that you can leave on the doughnuts once they hit the oil. This step is important, otherwise you won’t have very pretty looking crullers. Within seconds you will be able to remove the pieces of parchment from the oil and let the crullers turn to a golden color. Oh, and these “doughnuts” could totally be baked. Do whatever seems right to you. Baking would totally save you the step of having to cut out individual squares of parchment paper. Saving you a little bit of time, which is always good. 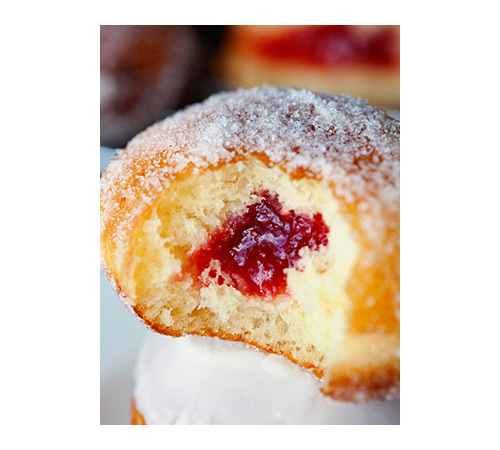 So, now that we’ve discussed how to make these, my new favorite doughnut, I am curious to know what your favorite is?? 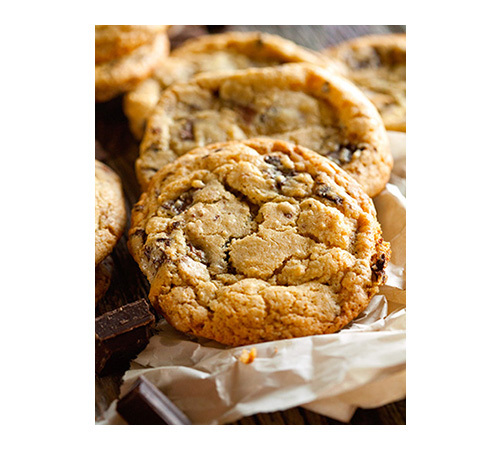 You certainly can’t go wrong with these – they’re the perfect weekend treat! Speaking of which, do you have any fun plans ahead? My hubby and I both have to take care of some work projects, but I’m hoping we can make some time on Sunday to enjoy the forecasted 60-degree weather. Woohoo! 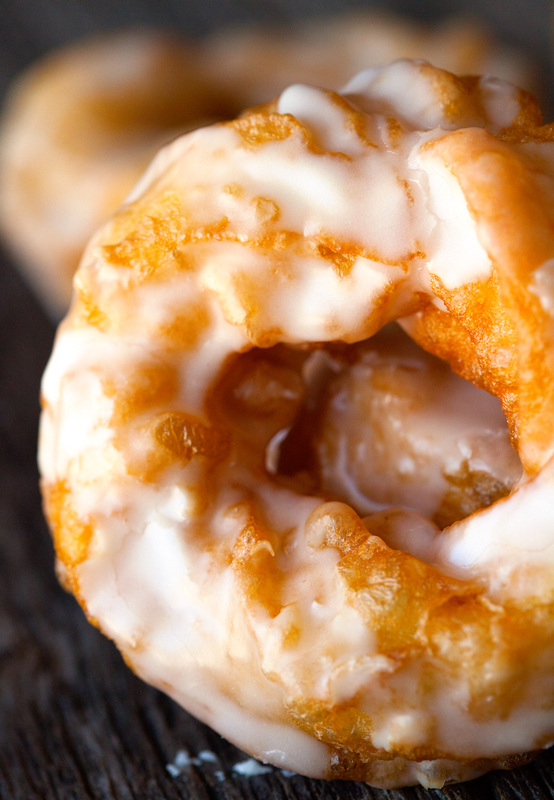 French Crullers are so airy and light, which makes them the perfect breakfast or afternoon treat. 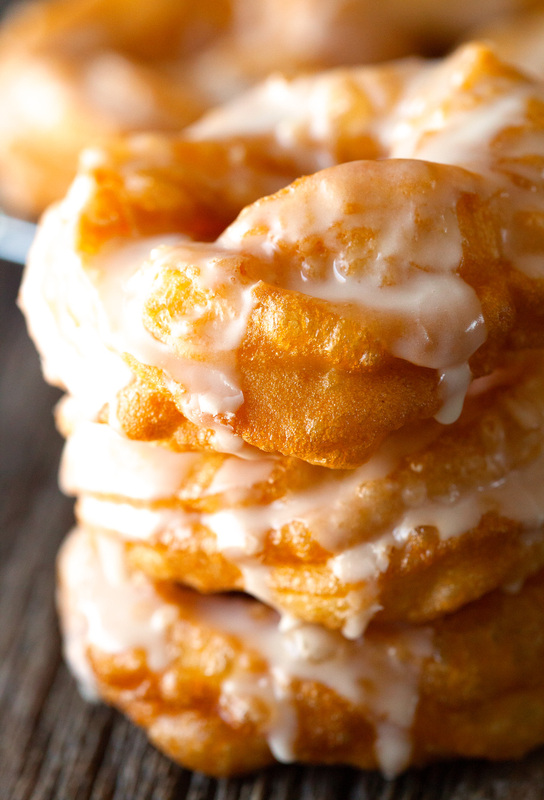 Enjoy these French Crullers in 30 minutes or less! 1. In a saucepan, stir together water, butter, sugar and salt. Bring to a rapid boil and stir in all of the flour. Continue cooking over medium-high heat and keep stirring. Mixture will be ready once a thin film starts to form over the bottom of the pan. 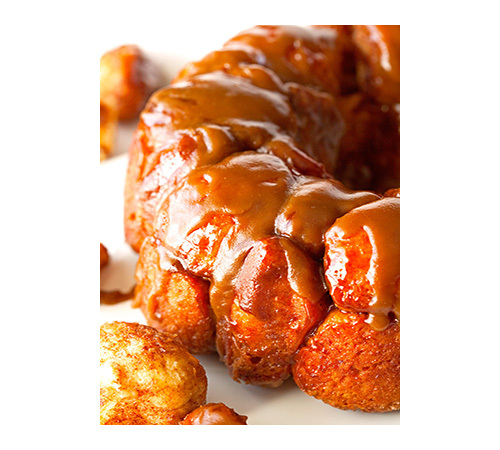 The longer you can cook the mixture, the lighter your crullers will be. Just be careful not to burn the dough. 3. Heat the canola oil in a large saucepan until it reaches 370 degrees F or preheat your oven to 450 degrees F (if baking). Cut out 12 parchment paper squares (about 3x3 inches) or line a baking sheet with parchment paper. Spray lightly with cooking spray. 5. For those that are baking these crullers, place baking sheet in the oven and bake for 5 minutes. Reduce heat to 350 degrees F and bake for another 15 minutes or until crullers are golden. Turn off heat, open the oven door and let crullers sit for 5 minutes before removing and glazing. For those that are frying these, line a plate with paper towels and place next to the saucepan containing the oil. Place one or two crullers at a time into the oil, paper side up. Remove parchment paper from the hot oil using kitchen tongs. Fry crullers two minute per side, remove from the oil and place onto prepared paper towel-lined plate to get rid of excess oil. Transfer to a wire rack to let cool. Repeat with remaining crullers. I love it when we find a recipe for something we love is not as difficult to make as we thought. These look scrumptious. Thank you so much, Natalie. Hope you had a fantastic weekend! Thank you, Christine! I had a blast making these and believe me, I was surprised they turned out so well :). It’s a super easy recipe. Mmm. I’ve been so hungry for donuts lately. These look great! Just got a donut cutter. Can’t wait for donut heaven. I don’t even own a doughnut cutter – can you believe that?? I think it’s about time I add one to my kitchen collection, don’t you think? Thank you, Melanie! You crack me up, lady. Definitely one of my favorite comments to date!! Thanks for sharing, Elizabeth. 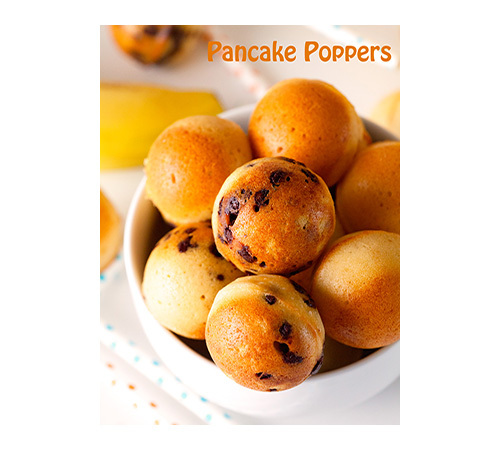 Hope you get to try them – they are soo delicious!!! Kathi – YUM! 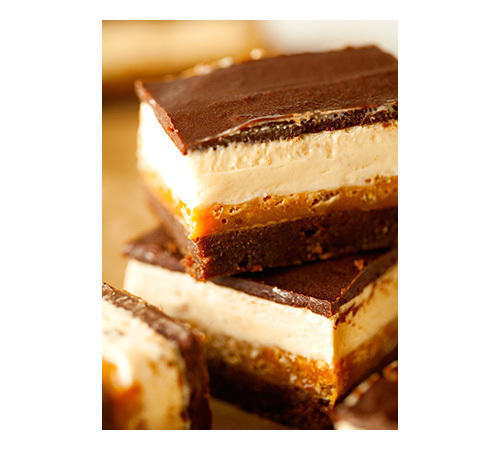 I could eat these for days…they looks heavenly! I could too and might have just done that, ha! Thank you so much, Jessica!! Oh my word, these are so beautiful. Great instructions too! Pinning to try soon! 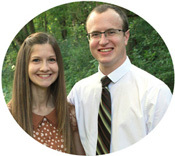 Thank you so much for pinning, Julie! I really hope you get a chance to make them soon – you’ll love them! 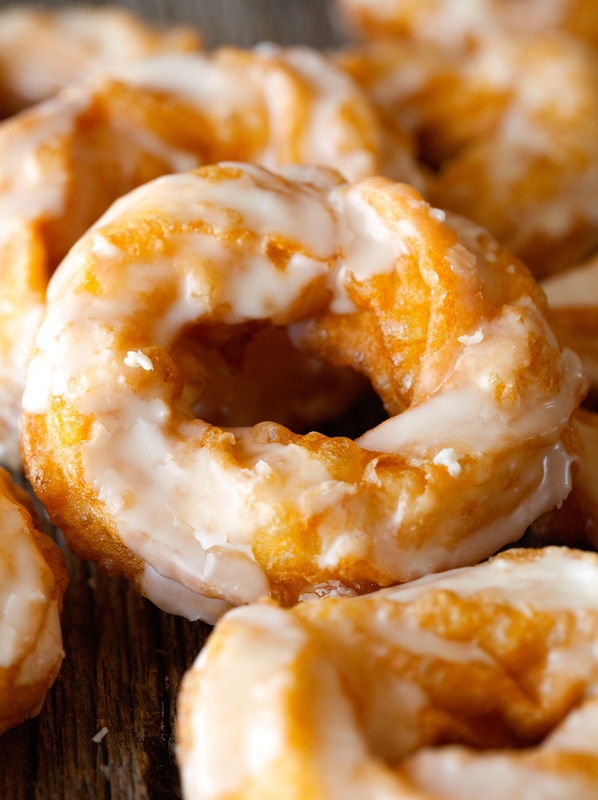 We used to have crullers every so often when I was a kid as a special treat! I love the sound of making them at home! These look like such a great treat! They really are a special treat, Ashley! I couldn’t believe how easy these are to make at home – they taste like the real deal. Thank you!! These look gorgeous and much easier to make than I would have expected, except that I’m useless with a piping bag! Ha! It’s much easier than you think. It honestly takes very little practice to pipe a ring of crullers. Hope you’ll give them a try sometime. Thank you, Corina! I am also useless with a piping bag so I use my cookie press with the star disk. Improvise; if you don’t have what you need, use what you’ve got. Those 20 pounds I just took off are about to come back in the form of crullers. I’ve loved crullers my entire life (70 years), but since moving to the boondocks have not been able to get them. Today that will change for I will be making my own. Thank you, thank you, thank you! I’m seriously going to stop coming to your blog. I’m not kidding you when I say that I have acquired a giant list of your goodies to make! Ugh! You’re killing me. I’m obsessed with french crullers. OBSESSED! I never even had the notion to make my own, and an easy recipe?! Love, love love this! You are seriously the best, Justine. Thank you for all the love. I wish we could get together and have a giant cooking and baking party – we’d probably never leave the kitchen, ha! I loooove donuts too! And wow, your crullers are the best looking things I have seen in a long time. They look perfect! So light and airy. I am scared of deep frying, but once I overcome my fear these are going to be at the top of the list! Can I add salted butter instead of unsalted? 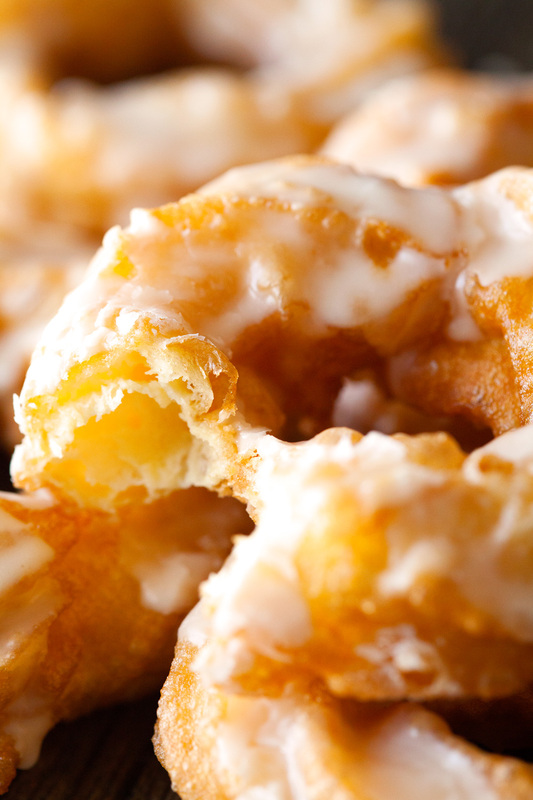 Your crullers look divine! My mouth is watering and now I have a big craving. Great recipes! Thank you, Nancy! So happy you stopped by! No film formed on the pan did i do something wrong? The only thing I can think of is that you might have not cooked the dough long enough. The film starts to form once most of the moisture evaporates and the dough pulls away from the sides. Hope that helps. Thank you so much for your sweet comment, Kelly! 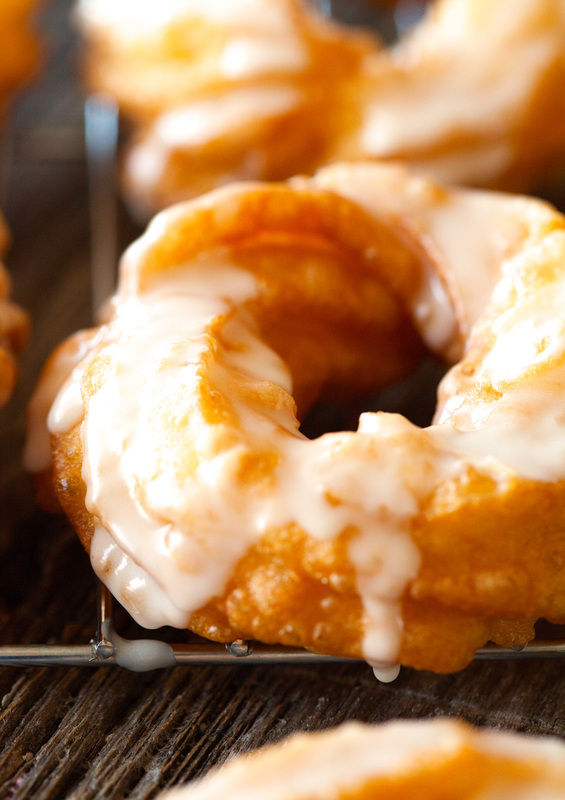 Crullers really are so easy to make and perfect for those special occasions. Thanks for the pin, too!! Ha! Thank you, Gloria. These crullers have everything you and I love :). Hope you get to make them soon – they are sooo yummy! Just catching up on posts I missed! Kathi, it’s like you knew that doughnuts are my most favorite ever. Seriously! I like cakes, pies, and cookies…but if doughnut’s a choice, I will always choose it! I am so happy to know I’m not the only one who is obsessed with doughnuts. There’s just something about them. I appreciate you catching up on posts, Ashley! You always bring a huge smile to my face :). 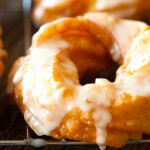 Hope you get to make crullers sometime – they are sooo good!! YOU CAN FREEZE CRULLERS? oh. my. Ha. Yes, you can. However, you need to make sure to they are sealed really well. Crullers cannot withstand freezer burn. Hope you get to make them. They are so yummy! Awww,you thought about me when you were making these! You knew I loved donuts and wanted to give me something new to make. Well thank you Kathi. I am definitely making these. Photos are great! These are so good. I was having trouble with the piping bag making donut shapes so I just made lines and cooked them that way, SO GOOD! Thank you! I am glad you liked them, Lauren Ann. It takes a little bit of practice with the piping bag, but either way, that doesn’t take away from the taste. Thanks for letting me know! Unfortunately, I would not leave out the eggs. They are essential to achieving the light and airy dough and the right consistency. I was wondering how big your star adapter is for making the crullers. 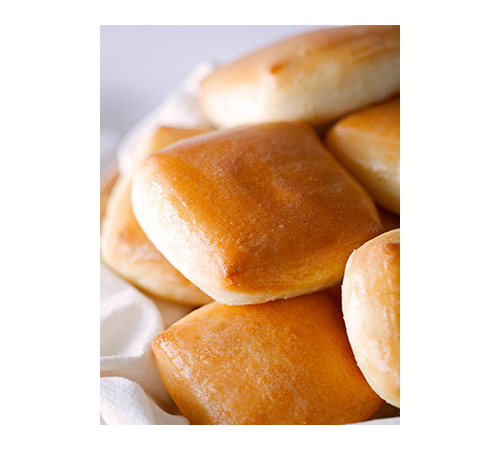 do you first let the dough cool down before adding the eggs…so as not to “cook” them? This is also my question. Waiting for an answer before I attempt this recipe. Thanks and these look amazing. 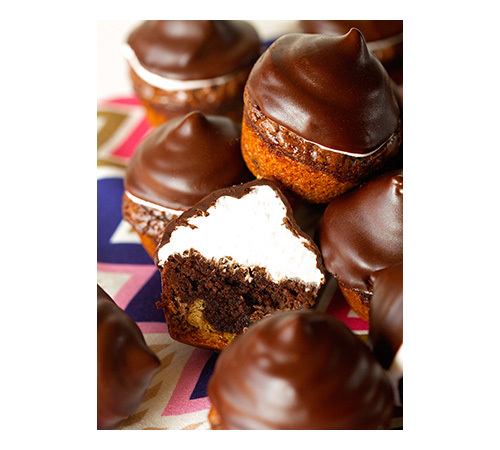 Can you use gluten free flour to make these? If so, what type of flour? There are so many. Rice, coconut, etc. Thanks so much! Can’t wait to make them!! Thank you for this great recipe! So easy (baked) and delicious.